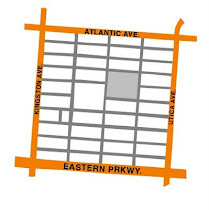 Save Our Streets Crown Heights has recently launched its Hospital Responder program, dispatching a Violence Interrupter to Kings County Hospital. Ariana Siegel, Special Projects Coordinator at the CHCMC, sat down with Kenneth Edwards, the first S.O.S. Hospital Responder, to learn more about the new initiative. Tell us about what you do as a Hospital Responder. I respond to instances of penetrating trauma, such as stabbings, shootings, and some types of severe beatings. I’m called to Kings County Hospital when the incident has taken place within the 11213 zip code. At the hospital I interact with the social workers, medical staff, the victim’s family and friends in an attempt to reduce the risk of retaliation and “recurrence,” in which the wounded person will return to the hospital because they indulge in the same lifestyles that brought them there. What is the procedure that you follow when you get a call? I’m on call 24/7, and any time someone is shot or stabbed I’ll be called to the hospital. When I get to the hospital the social worker will tell me what information they have about the incident. If I’m able to, I’ll go see the victim directly, and if not, I’ll start interacting with the family and friends and try to get as much information as I can, and assist the Outreach team that are working in the community. I’ll also start mediating any situation that is coming up. The perpetrator could possibly be on the scene, unbeknownst to others, because they want to know the status of the victim as well. So I have to pay careful attention to everything that’s going on. Who else is involved with the Hospital Responder program? 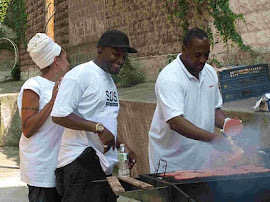 I work with Man UP Inc which is an antiviolence program in East New York. I also work with KAVI, King’s Against Violence Initiative, which deals with all types of violence that appears in the hospital, shootings or stabbings, teenagers or adults. Dr. Gore, a trauma unit physician who helped on this projest at the hospital is also the director of KAVI. Why did you want to be a Hospital Responder? I used to feel that, if gun violence doesn’t knock on my door then why care about it? But I saw that that many of the harmful things that I did as a youth were still being done today by the youths and adults; nothing really had changed. I wanted to feel safe walking through my neighborhood and want others to feel safe, so I realized that I had to be a part of the change. I started out as a Violence Interrupter because I wanted to be a part of the effort to bring down that risk of gun violence to the community. After that I wanted to become a Hospital Responder because I felt that there were different areas that we needed to deal with in order to stop retaliation. A lot of times the S.O.S. team deal with people in the street, but there are other areas that people are congregating to talk about retaliation. One of those areas is the emergency waiting room where the victim’s friends go. What is the most rewarding about this work? I enjoy seeing the family and the victims that survive and are willing to make a change. They really make an effort to let me help them and let S.O.S. be a part of their life. Recently, there was a young lady who was stabbed in the chest, who was in denial about what had happened: she told the medical staff that she fell on something. But she felt more comfortable talking to me because I’m not a part of the hospital or NYPD, and she revealed to me that she was a victim of domestic violence. I explained to her what services could be available to her, and she agreed to speak to the social worker. I referred her to an agency that she’s continued to go to for counseling and she’s still going now. That’s one of my first success stories. Is there any aspect of this work that’s particularly difficult for you? It’s difficult when you have to talk to the families of the victims that have passed. We’re human, and it’s very difficult to talk to someone and not feel the pain that they’re going through. Just recently with a stabbing victim that died, I walked that family through the whole process of the grieving at the hospital and going to see their loved one’s remains. I stood there with them, and comforted them, and gave them information. That right there is the most difficult part. How do you deal with the stress related to this work? The stress levels in this job are very high, but we try to practice self-care. Every two weeks I go and sit down with a social worker and talk about any type of trauma that I’m dealing with. Sometimes I may just talk to her about things that are generally on my mind. A lot of times we internalize past traumas, so a past trauma may come out in that environment and it’s important that we deal with issues as they come up. Talking to someone is one thing, but sometimes you have to do physical activities to get that stress out. Dr. Gore and I have gone snowboarding. You have to be mindful and take care of yourself because if you don’t take care of yourself how are you going to be able to take care of somebody else? How can you measure your success of the program overall? One way that we will measure success is by seeing a reduction in the “recurring” phenomenon: not seeing the same individuals coming back, maybe not ever seeing people from the 11213 area code come into the hospital due to a shooting or stabbing. It’s a team effort between the hospital and those working in the community; their goals are the same, to reduce penetrating trauma and save lives. How do you see the program changing in the future? I see it growing tremendously. My vision is to have it in other hospitals, not just in Crown Heights and East New York but in places where the shootings and fatalities are on the rise. We need to really focus on shooting retaliation like I’m doing inside the hospital. I hope that we are successful enough that people want to replicate the program elsewhere. What is the impact of this program on the community at large? Before S.O.S. there really wasn’t too much hope–the community didn’t really believe in itself. Ever since S.O.S. 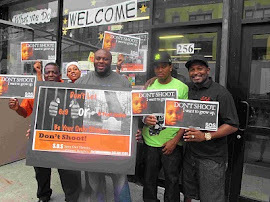 came into existence people now say that they have a chance, and that they have a voice to speak out against the gun violence or any kind of violence in the community. So when we see people coming to our rallies and participating in our events, that shows that we have made a tremendous impact on a community that didn’t used to believe in itself. How do you see this work as part of your larger goals in life? I see myself working in this field for a very long time because I know that this problem is not going to cease to exist overnight. And as long as it does exist, we will try to recruit more people who are willing to put forth the effort to end it. This is my passion; this is where my heart is at. I live in the community and I’m tired of seeing it falling. What inspires you or motivates you to keep going when things are difficult? Once, a child came up to me and said, “Save my brother. Don’t let my brother get shot and killed.” To have a little child come up to you and say that, it hits you—violence doesn’t just affect the people that are directly involved, it affects your family, your friends, everybody. We shouldn’t all have to live in fear. So as long as people are living in fear, I’m inspired to go and try harder in order to stop the next person from being shot or killed.